Rev. Michael Megahan (pronounced muh-GAN) and his wife Jo Ann have been committed to serving others in the name of Jesus. They are dedicated to devoting their lives to the mission of bringing people to faith in Jesus Christ. 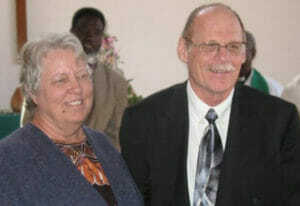 In 1982, Michael and Jo Ann were called to serve as Bible school teacher and pastor in Tanzania. In 1988, Michael became assistant to the bishop of the East of Lake Victoria Diocese in Mwanza. In 1998, the World Mission Prayer League sent the Megahans to the mountains of north central Kenya to work with the Samburu tribe, which had no Bible in their language. As a result of his work with the Samburu, Michael saw the need for getting the Bible into the hands of more people in their own language. In 2004, after attending the Graduate Institute for Applied Linguistics (GIAL), the Megahans were appointed as missionaries with Lutheran Bible Translators. In 2005, the Megahans moved to Francistown, Botswana, where Michael served as the exegete with the Kalanga Bible Translation Project. An exegete studies the original Greek, Hebrew or Aramaic texts and helps the local translators accurately translate the meaning into their own language. That project was completed in 2017. Michael and Jo Ann retired from full time service in 2017, but Michael continues as an adjunct missionary on a part-time basis. His current position has taken him full circle, now assisting to make God’s Word available in the same part of the world where he started his mission involvement back in 1982.